Bring family, friends and food to enjoy a picnic in one of three shelters, or at one of the many picnic tables along this sinuous stretch of Big Creek. Discover the many animals who make this urban oasis their home. 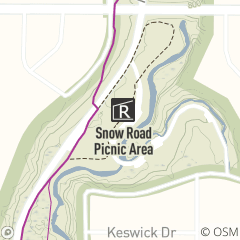 Snow Road Picnic Area features three open shelters and is located off Big Creek Parkway in Big Creek Reservation, south of Snow Road in Parma Heights. Let's highlight a pleasant May walk with a spring wildflower search.